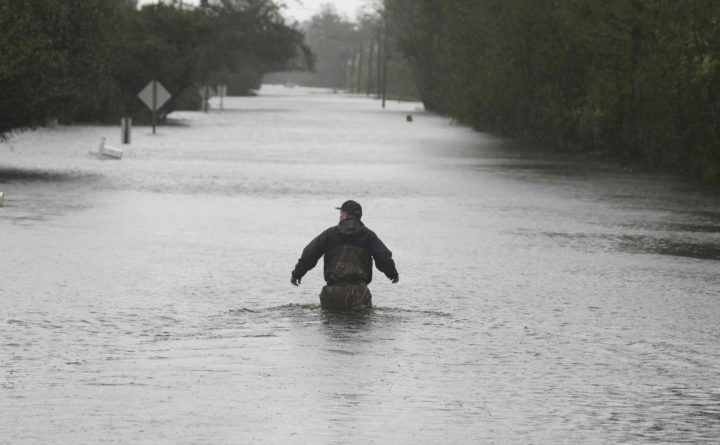 A member of the U.S. Coast Guard walks down Mill Creek Road on Saturday checking houses after tropical storm Florence hit Newport, North Carolina. NEW BERN, North Carolina — As the death toll from Florence grew and hundreds of people were pulled from flooded homes, North Carolina braced for catastrophic, widespread river flooding that could be the next stage of a mounting disaster. Weakened to a tropical depression early Sunday after blowing ashore as a hurricane with 90 mph winds on Friday, Florence was still spinning slowly atop the Carolinas as it pulled warm water from the ocean and hurled it onshore. Radar showed parts of the sprawling storm over six states, but North and South Carolina were in the bull’s-eye. The Defense Department said about 13,500 military personnel were assigned to help relief efforts, which could be massive since river forecasts showed major flooding was likely in towns as far as 250 miles inland. Fayetteville’s city officials, meanwhile, got help from the Nebraska Task Force One search and rescue team to evacuate 140 residents of an assisted-living facility in Fayetteville to a safer location at a church. Already, more than 2 feet of rain has fallen in places, and forecasters are saying there could be an additional 1½ feet before Sunday is out. “Floodwaters are rising, and if you aren’t watching for them, you are risking your life,” Gov. Roy Cooper said. Florence weakened to a tropical depression early Sunday and was crawling west at 8 mph. At 5 a.m., the storm was centered about 20 miles southwest of Columbia, South Carolina. Its winds were down to 35 mph. On Saturday evening, Duke Energy said heavy rains caused a slope to collapse at a coal ash landfill at a closed power station outside Wilmington, North Carolina. Duke spokeswoman Paige Sheehan said about 2,000 cubic yards of ash were displaced at the Sutton Plant and that contaminated storm water likely flowed into the plant’s cooling pond. “Amazing. They did awesome,” said Knox, who was stranded with seven others. Associated Press writers Alex Derosier, Jonathan Drew, Emery P. Dalesio, Denise Lavoie, Sarah Rankin, Gary Robertson, Meg Kinnard, Seth Borenstein, Michael Biesecker, Martha Waggoner, Jennifer Kay, Russ Bynum, Pete Iacobelli and Jay Reeves contributed to this report.